How Many Dental X-rays Are Too Many? Question: Every couple of times that I visit my dentist's office, she asks me to submit to more dental X-rays. I seem to be getting an awful lot of them. I don't want to increase my chances of getting cancer. How often should I be getting dental X-rays? ANSWER: You're not the only patient who has expressed concerns about exposure to radiation from dental X-rays. The thought has crossed my mind many times, too. So it's a good question. But, unfortunately, there is not one answer for everyone. It depends on many factors including how much dental work you've had in the past, the current condition of that work, your dental hygiene and if you have any signs or symptoms of dental decay or gum disease. Even your age needs to be taken into account because your risk of oral problems varies throughout your life. The dentist's decision to take an X-ray "always has to be patient-specific and risk-based," explains Dr. Susan Sutherland, chief of dentistry at Sunnybrook Health Sciences Centre. Dental X-rays, she notes, are necessary for identifying hidden dental decay -- such as in the areas between teeth or beneath old fillings and crowns. They also reveal bone loss that accompanies gum disease. This information can help determine what treatments you might need. Early intervention might help save a tooth or limit the amount of required restoration. There is clearly a benefit to having X-rays. But any level of radiation poses a potential risk to patients. For that reason, you want to minimize your exposure as much as possible. "There is a general principal in radiation safety called ALARA -- as low as reasonably achievable," says Dr. Sutherland. In other words, you always prescribe the least amount of radiation that's necessary to do a particular job -- such as monitoring or diagnosing a certain condition. 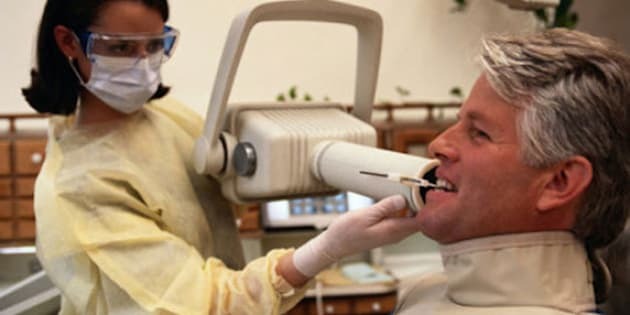 To help dentists make these critically important decisions, professional dental organizations issue general guidelines about when X-rays should be performed. For instance, a document produced for the American Dental Association suggests that an adult with good oral health and low risk of dental problems should have x-rays taken at intervals of every 24 to 36 months. The Canadian Dental Association relies upon the same document for its recommendations. Even with theses guidelines, dentists shouldn't be blindly following them to the point where they automatically have X-rays taken at set times for their patients, says Dr. Ernest Lam, a professor of dentistry and head of oral and maxillofacial radiology at the University of Toronto. "Whenever an X-ray is ordered, it should be done only after a clinical exam has been performed by the dentist," he says. This approach helps ensure that the dentist uses his or her professional judgment to determine if an X-ray is really necessary. Dr. Sutherland agrees, emphasizing the decision to order an X-ray should be made on a case-by-case basis. She says some of her adult patients have X-rays taken every five years. Others, however, get them every two years -- or even more frequently. In any discussion about X-rays -- and the assessment of their potential risks and benefits -- it's important to keep in mind that we are also exposed to natural radiation in the environment. Radiation constantly rains down on us from outer space, explains Dr. Paula Sikorski, an oral and maxillofacial radiology consultant in Sunnybrook's Department of Dentistry. There are also elements in the earth that are producing a steady stream of radioactive particles. By contrast, you receive a dose of eight or nine micro-Sieverts for each intraoral X-ray, provided the dentist is using either fast-speed film or digital imaging, says Dr. Lam. With slower speed film, the dose would be roughly doubled. Each intraoral X-ray shows several teeth, from the upper surface to the supporting bone. A dentist might order multiple images to reveal an area of concern. A dentist can also rely upon a "panoramic" X-ray,which shows the entire mouth area - all the teeth in both the upper and lower jaws. The dose from this type of X-ray is about 24 micro-Sieverts, says Dr. Lam. Overall, the amount of radiation you get from dental X-rays is relatively small -- especially when compared with the radiation you receive from natural background sources. Even so, "we can't be indiscriminate about X-rays because radiation [risk] is cumulative," says Dr. Sutherland. "As health professionals, we shouldn't be contributing more than we need to in order to make a proper diagnosis." After all, it's impossible say when radiation from any number of sources might randomly damage the genetic material of a cell and set the stage for a cancer. Aside from keeping X-ray exposure to a minimum, dental offices are required by provincial regulations to follow certain procedures when the images are taken -- such as placing lead aprons and neck collars on patients. If you feel you may be getting too many X-rays, you should have a discussion with your dentist, advises Dr. Lam. "Ask the dentist for an explanation and how those X-rays are going to impact on your care," he suggests. In other words, how is the information from the X-ray going to be used and will it make any difference in your treatment? Dr. Lam points out that many patients assume the dentist who is treating them will do the right thing. "I think patients need to be their own advocates, they need to be educated, and they should not be afraid to ask questions," says Dr. Lam. You may find the dentist has a good reason for the frequency at which your X-rays are being taken. You may be one of those people who -- for a variety of reasons -- is especially vulnerable to dental decay and gum disease. But, of course, if you are not satisfied with the answers, it's your prerogative to say no to the X-rays. Co-authored by Paul Taylor, Personal Health Navigator at Sunnybrook.